The second part of this series focuses on safe injection practices with some pictures from the field of poor practices. Wash hands prior to preparing any medication, every time. Medications should be prepared in an area that is free from contamination on a clean work surface. Outbreaks have been linked to preparing medications in areas contaminated with blood or body fluids as well as in the same area that (used) syringes are disassembled. Use single dose vials, when available, to reduce the potential for contamination. Drawing up medications in an area other than a pharmacy clean room has the potential to introduce organisms from the air into the medication. Always use aseptic technique to avoid contamination of medication or administration materials. Always use single dose vials for only one patient. A 2008 outbreak in an endoscopy center in Nevada was traced to the use of a vial of propofol for multiple patients. The provider changed the needle but reused the syringe to obtain additional medication for one patient. When the same vial of propofol was used for subsequent patients, despite using a clean needle and syringe for those patients, hepatitis C was transmitted. If the need arises due to a shortage of a critical medication, only a qualified healthcare person capable of repackaging the medication under International Organization for Standardization (ISO) Class 5 conditions as described in the United States Pharmacopeia General Chapter 797, Pharmaceutical Compounding – Sterile Preparations may perform this task. Don’t use the size of the vial as a signal of intended use: single use vials may be large while some multiple use vials are small. In this picture, three of the four Gentamicin vials are labeled as multiple dose. The vial with the blue lid is the only medication labeled as single use. Always read the label, even for frequently used medications! Discard single dose vials immediately after use to prevent microbial growth since they generally don’t contain preservatives. Some of the commonly abused (used for more than one patient) single dose vial medications include Botox, propofol and contrast media. Do not combine ‘leftover’ medications from multiple vials to save money. Outbreaks have been linked to this practice. Always disinfect the rubber stopper prior to entering a vial, including immediately after removing the ‘lid’. There isn’t a recommended time to disinfect the vial stopper, however, be sure to wipe in one direction only and allow the disinfectant to dry prior to accessing the vial. 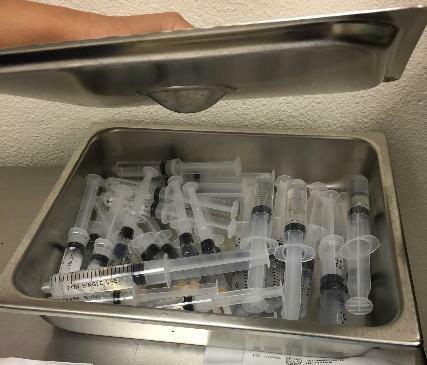 Multidose vials should be accessed with a clean needle and syringe each time, even when medicating the same patient, to prevent contamination of the vial contents. Although some healthcare personnel may intend to discard the vial after use if entered with a used needle and/or syringe, sometimes interruptions may preclude this action. The best practice is to never enter a vial with a used needle and/or syringe. According to USP 797, multidose vials should be labeled with a 28 day beyond use date, unless the vial is due to expire before 28 days or the manufacturer recommends a different timeframe for opened vials. A very controversial topic with multidose vials is accessing the vial in the patient treatment area. The patient treatment area in a clinic is the treatment or procedure room while in the Surgical Suite the treatment area is the procedure room. Accrediting agencies will cite facilities if medications are drawn up in the operating room, even if it is done after the room has been cleaned. The best rule of thumb is to prepare medication in a designated medication preparation area outside of the patient treatment area. Dedicate multi-dose vials to a single patient if the vial is accessed in the treatment area. Nurses in many settings and anesthesia providers commonly carry medication filled syringes in their pockets. Although not addressed by the CDC, the Association for Professionals in Infection Control and Epidemiology (APIC) discourages this practice since medication errors have occurred as a result of carrying syringes of medications in pockets. Additionally, the potential exists for contamination of the plunger as clothing rubs against it. Always wear a mask when administering injections into a joint, the spine or subdural space. Failure to wear a mask during joint injections has resulted in septic arthritis caused by Streptococcus, hospitalization and surgical debridement. Do not unwrap syringes for storage. Do not store prefilled syringes together for later use. Syringes should be unwrapped immediately prior to use. 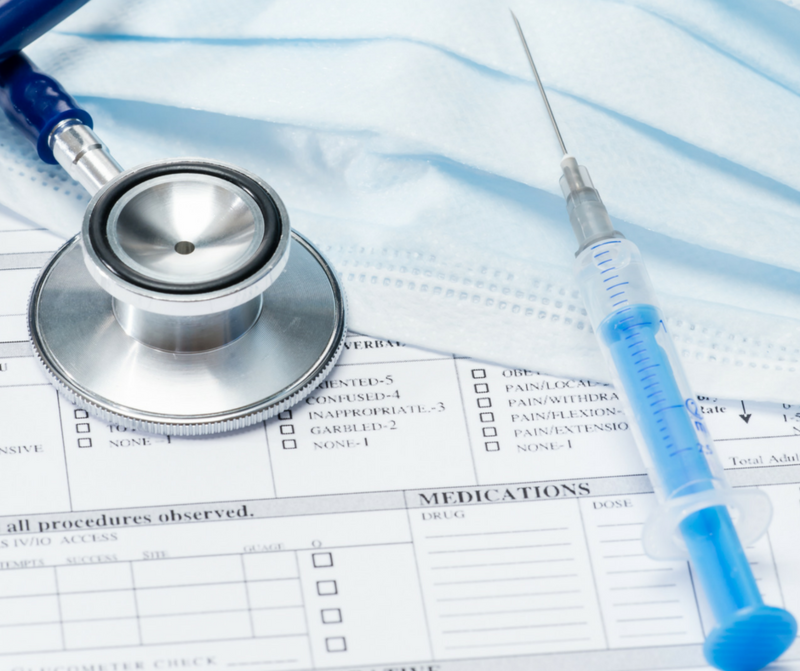 Pre-drawing medications (prefilling syringes) is another controversial topic among practitioners. However, the APIC position statement and USP 797 clearly states that medications should be used within one hour of preparation or as soon as feasible. since this provides a direct pathway for organisms to enter the vial and contaminate the contents. 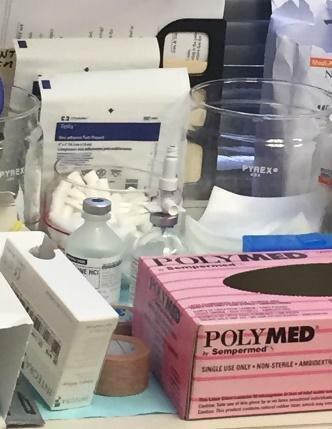 This picture shows a nice pathway to the vial contents through the needleless adapter and is also is a great example of an unsafe medication prep area. Try to look at medication prep areas with ‘new’ eyes to ensure these areas are clean, dry, and uncluttered. Perform competency assessments on all personnel responsible for administering or preparing medications. Periodically observe injection practices as well. Ambulatory Surgery Centers and Hospitals can use the Centers for Medicare and Medicaid Services (CMS) infection control checklist to conduct direct observations. Additionally, outpatient facilities can use the CDC’s Guide to Infection Prevention for Outpatient Settings: Minimum Expectations for Safe Care. Don’t assume an experienced or highly educated person is competent in this area by virtue of their experience or education. A national survey among physicians practicing in pain management, dermatology, or gastroenterology and nurses (in any practice setting) revealed that an alarming percentage of physicians and nurses reported unsafe practices in their workplace. All healthcare personnel should receive regular education and training regarding safe injection practices. To assist with education efforts, the CDC’s One and Only Campaign offers videos such as The Safe Injection Practices video for healthcare providers [13:00 mins].